The BMO Harris Bank Premium Rewards Mastercard currently has an Informr score of 7.5 out of 10. This score is based on our evaluation of 3 sources including reviews from users and the web's most trusted critics. 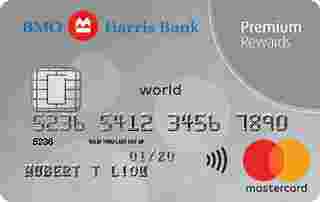 BMO Harris Bank Premium Rewards Mastercard is typically available to those with excellent credit scores (650 or greater). For $79 a year, the BMO Harris Bank Premium Rewards Mastercard offers solid rewards for frequent travelers, but the card’s moderately high APR and short interest-free balance transfer period limit its appeal as a balance transfer card. This card offers a pretty nice bonus that’s not too difficult to earn, as well as secondary benefits like points back and card member perks. This card gives traveling benefits with a low annual fee, so consider this card if you like to travel. - Intro rate applies on balances transferred within the first 90 days of account opening. - This APR will vary with the market based on the Prime Rate. Up to $2,500 in combined purchases per quarter. Receive an anniversary point bonus equal to 15% of your annual eligible purchases. The card shares plenty in common with better known travel cards such as Citi ThankYou Premier and Chase Sapphire Preferred. It has a tiered point-earning system that rewards spending in discretionary categories, a broad set of redemption options that include travel and general merchandise, and some truly generous travel benefits.